Were you part of The John Hall Pre-University Course in Venice between 1965 and 2015? Then here it is: the ultimate insiders' collection of special memories and reminiscences. 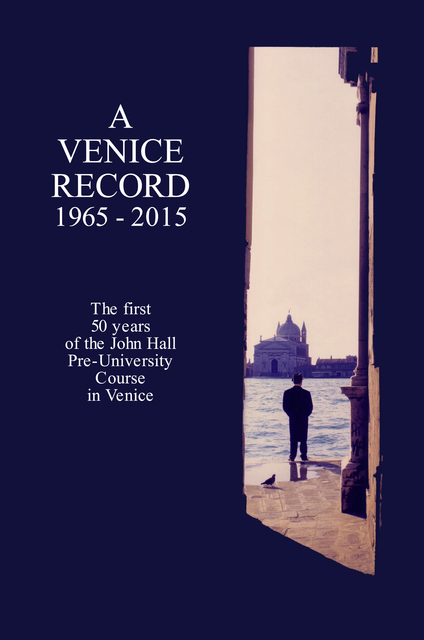 Published to celebrate the first 50 years, A VENICE RECORD captures the spirit of the course with contributions from students, art historians, artists, musicians, theatre, film people, scientists & historians, - all who have shared these ephemeral Venetian moments. The book is also a record of names of all alumni, and everyone who has taught on the course year by year. THE VENICE COURSE- WHAT IS IT ? Put simply, the Course is a nine-week introduction to some of the most thought-provoking achievements in the Western world, from the Classical Past to Today. Conducted through on-site visits and a series of lectures by a team of world-class experts chosen for their charisma and ability to communicate, the Course includes not only Art - painting, sculpture and architecture, but also music, world cinema, some global issues, literature, history. It is an exciting and enriching experience for everyone. Additionally, we offer brilliant practical classes in studio life drawing and portraiture, photography, cookery and Italian language. The Course was started in 1965 by John Hall in the context of the English educational system, where it is common for students to take a Gap Year before starting university. Going to Italy after leaving school is a tradition established centuries ago and is as alive and relevant as ever.